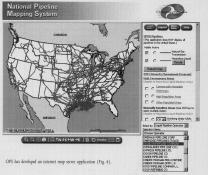 The National Pipeline Mapping System (NPMS) is a geographic information system (GIS) created by the US Department of Transportation, Office of Pipeline Safety (OPS) in cooperation with other federal and state governmental agencies and the pipeline industry. The purpose of the effort is to provide a centralized database of geospatial pipeline data to be used as a tool for OPS decision support, emergency resposne, inspection planning, community need-to-know, and regulatory compliance. It consists of geospatial and attribute data and metadata related to the interstate and intrastate natural gas transmission and hazardous liquid pipelines and LNG facilities jurisdictional to OPS. The office has been in contact with members of pipeline trade associations regarding participation in NPMS. 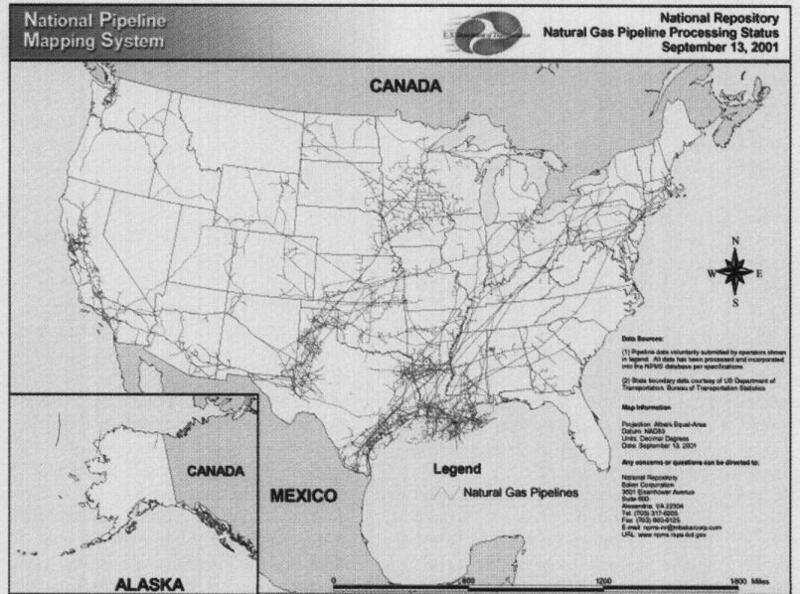 As of Sept. 13, 2001, NPMS contains approximately 87% of hazardous liquid and 49% of natural gas transmission pipeline mileage under OPS jurisdiction, for a total of 61 % of pipeline mileage being collected for NPMS (Figs. I and 2). With the help of NPMS, OPS is moving forward with rulemakings that require risk-based pipeline-integrity management. Through visualization, geospatial analyses, and the integration of various databases, OPS is using NPMS to help ensure the safe, reliable, and environmentally sound operation of the nation's pipeline transportation system. * Accurate maps that identify the location of the operator's natural gas transmission, significant distribution, and major hazardous liquid pipeline facilities in the state. * A description of the characteristics of the operator's pipelines in the state. * A description of the products transported through the operator's pipelines. * Any other information that OPS considers useful to inform a state of the presence of pipeline facilities and operations in the state. In addition, this information is to be made available by the operators to OPS and appropriate state officials upon request. To meet the intent of the mandate, OPS has been requesting that operators voluntarily submit reasonably accurate geospatial and attribute data*on natural gas transmission pipelines, hazardous liquid trunklines, and LNG facilities operating in the US. Standards for geospatial and attribute data and metadata have been drafted for use by operators in preparing their submissions to NPMS. NPMS consists of a national repository and 14 state repositories. The national repository is headquartered in Alexandria, Va.; the state repositories are maintained by various state agencies and universities and currently reside in Alabama, California, Connecticut, Illinois, Kansas, Kentucky, Louisiana, Maine, Minnesota, New Jersey, Oklahoma, Texas, Virginia, and Washington. These state repositories are responsible for processing the pipeline and LNG facility data within their state boundaries. Additional state repositories are solicited through the Commerce Business Daily (CBD). This publication lists notices of propsed government procurement actions, contract awards, sales of government property, and other procurement information. The repository is primarily responsible for processing data for states without repositories, maintaining NPMS web site, and maintaining an internet mapping application. The national repository incorporates data from the state repositories to create a seamless national pipeline and LNG database and serves as the final processing and storage facility for all pipeline facility data. Two NPMS standards documents exist. The Operator Standards describe how operators can participate in NPMS. The Repository Standards describe the operations of NPMS state and national repositories. The national repository has also developed metadata and attribute data software templates. These standards and templates are available for download from NPMS web page (www.npms.rspa. dot. gov). OPS uses a risk-based regulatory approach. In December 2001, the office published rulemaking "Pipeline Integrity Management in High Consequence Areas [operators with 500 or more miles]" (Integrity Management Program, IMP). The objective of the rule is to improve pipeline safety through new requirements for periodic testing, integrated evaluation of risk information, improved federal and state oversight of operator integrity management programs and plans, and enhanced communication to communities. The national pipeline map of hazardous liquids pipelines as of mid-September contained 87% of the lines operated in the US under jurisdiction of the US Department of Transportation's Office of Pipeline Safety (Fig. 1). The national pipeline map of natural gas pipelines as of mid-September contained 49% of lines operated in the US under jurisdiction of the US Department of Transportation's Office of Pipeline Safety (Fig. 2). The initial rule applies to operators with 500 or more miles of hazardous liquid pipelines jurisdictional to 49 CFR Part 195. OPS will finalize a similar rule for operators of smaller, jurisdictional liquid pipeline systems. It also intends to issue an integrity management rule for natural gas transmission operators, as well as requirements to improve community awareness in 2001. A key feature of IMP is to provide protection for OPS-defined high-consequence areas (HCAs). Instead of a simple plan for inspections, IMP requires that operators focus resources to ensure the integrity of pipeline facilities in geographic areas (HCAs) where the consequences of a pipeline release would be most adverse. HCA definitions will vary between hazardous liquid and natural gas integrity management programs. Hazardous liquid HCAs were defined with the help of GIS technology and readily available data. Populated areas, environmentally sensitive areas, and water-ways were identified in the early development of the rule as areas in need of protection. * Environmentally unusually sensitive areas (USAs), including both ecological and drinking water USAs (defined in 49 CFR Part 195.6). * High population areas (HPAs) and other populated areas (OPAs), which are derived from US Census Bureau-delineated urbanized areas and census designated places. * Commercially navigable waterways (CNWs), which are derived from a dataset produced on behalf of several federal agencies responsible for navigable waterway delineation, including the US Coast Guard and the US Army Corps of Engineers. Under this rulemaking, operators must develop written integritymanagement programs. As part of this integrity-management program, operators must identify all pipeline segments that could affect an HCA. NPMS is an invaluable resource for this task. With the exception of USAs, all HCAs are currently delineated and available in digital format to the pipeline industry through NPMS website. USAs are partially complete at present and are to be completed by yearend 2001. Approximately 87% of the hazardous liquid pipeline mileage jurisdictional to 49 CFR Part 195 resides in NPMS as of Sept. 13, 2001. Using GIS and the data as provided by NPMS, operators can easily and quickly identify pipeline segments with the potential to affect high-consequence areas. In addition, hardcopy maps submitted to NPMS have been digitized. After processing, a digital copy of the data is provided back to the operator. Finally, NPMS provides a common data set as reference for both operators and regulators to aid in achieving the requirement of identifying pipeline segments that can affect HCAs. Natural gas HCAs will likely be provided to OPS by natural gas transmission operators. Unlike the hazardous liquid IMP, natural gas IMP will focus HCAs on populated areas. The operators will provide OPS pipeline data (consistent with NPMS standards) that also include data identifying sections of the pipeline that pass through populated areas yet to be fully defined. OPS will augment the operator submitted data with purchased data that identifies the locations of hospitals, nursing homes, schools (including nursery, elementary, secondary, vocational and colleges), libraries, and correctional institutions. The NPMS homepage provides general information regarding the ability to download standards, software, and data and metadata, statistics regarding NPMS participants and their submissions, and contact information for the NPMS repositories and management (Fig. 3). HCA boundaries will change over time due to population expansion, the addition of environmental data, etc. Updated HCAs data layers will incorporate version control and be made available to the industry via the internet. Any new HCAs must be incorporated into operators' integrity-management plans within 1 year of the identification of the new areas. Integrity assessments of segments that could affect these new HCAs must be completed within 5 years of their identification. NPMS is utilized in a variety of applications within OPS. Integrity-management rulemaking is shaped by the ability to obtain and provide geospatial data layers that can be used to identify populated and environmental areas that require additional protections. OPS is incorporating the use of global-positioning-system technology to collect data that can be incorporated into NPMS better to identify locations of incidents and accidents. 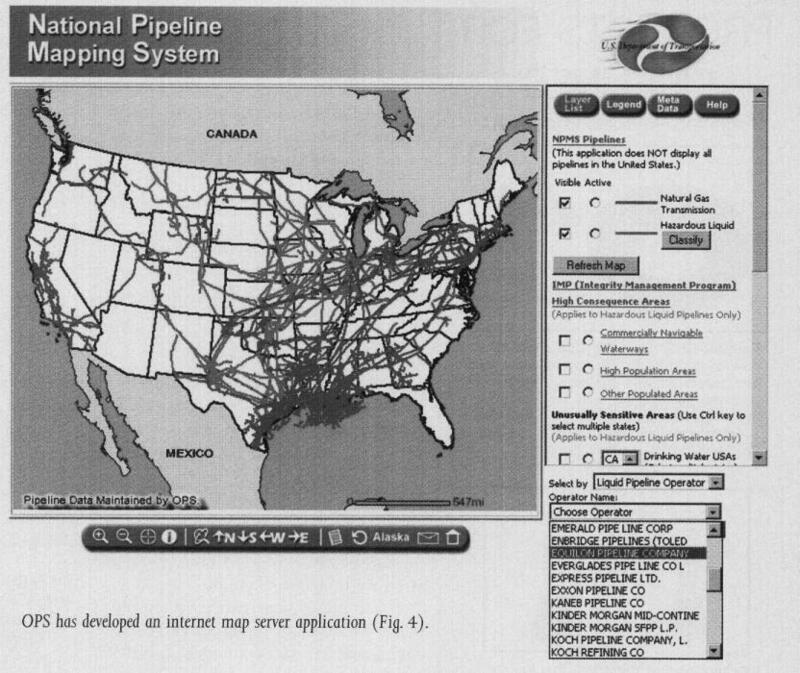 NPMS is used to analyze and respond to various congressional and departmental requests for pipeline information. OPS is also working towards integrating existing non-geospatial databases with NPMS to allow users to perform analyses that are currently unavailable. NPMS is an important link between OPS and the pipeline operators. It provides the common framework for identifying hazardous liquid and natural gas transmission (pending completion of a gas integrity-management program) pipelines that cross through high-consequence areas. By developing this common framework, OPS inspectors and the pipeline operators will be working from the same data. Enabling OPS inspectors with laptop GIS capabilities when they perform inspections will be an invaluable advantage to both OPS and pipeline operators. The framework will remain successful as long as pipeline operators continue providing initial and subsequent data updates to NPMS. A homepage for NPMS (www.npms.rspa.dot.gov) provides general information regarding NPMS, the ability to download standards, software, and data and metadata, statistics regarding NPMS participants and their submissions, and contact information for NPMS repositories and management. OPS has also developed an ESRI internet map server (IMS) application that was publicly available before Sept. 11 (see sidebar). The office is investigating the option of developing a secured IMS application accessible to pipeline operators and local, state, and federal governmental representatives. The application allows users to view pipelines that have been incorporated into NPMS in relation to high-consequence areas and other geographic features. * Query pipelines by pointing to a specific pipeline graphical element. * Choose a pipeline operator name from a pull-down menu. * Zoom to a selected state, county, or ZIP code view. * View relationships between pipelines and their environments. The IMS has the potential to serve as the primary tool for providing pipeline-related data layers to pipeline operators and other governmental agencies. With the exception of ecological and drinking water unusually sensitive areas, all high-consequence areas are also available for download from NPMS homepage. 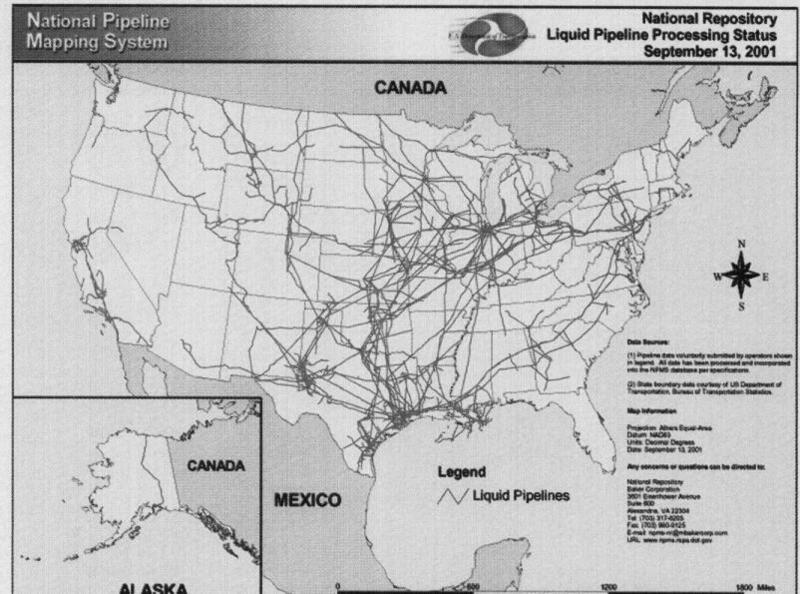 The drinking water USA data and the ecological USA data are available to hazardous liquid pipeline operators. Both must be requested from OPS; instructions for making data requests are on NPMS web site. OPS has developed an internet map server application (Fig. 4). * Earthquake, hurricane, flood, and landslide hazard indexes. * State and county boundaries. * US DOT Bureau of Transportation Statistics' National Transportation Atlas Data. * US Geological Service's National Hydrography Dataset. *US Postal Service ZIP codes. National security issues relating to NPMS are continually being evaluated. Pipelines are classified as "critical infrastructure," and OPS plays an important role in ensuring their safety. At the same time, OPS is committed to providing federal and state regulators and local jurisdictions with pipeline information so they are better educated about pipelines affecting their jurisdictions. Because OPS is primarily interested in the locations of pipelines and their environments, data contained in NPMS are generic. They include such information as operator name, pipeline system name, commodity, and an estimate of the data positional accuracy. Diameter is an optional field; there is no information that could be used to calculate consequence of failure such as pressure or throughput; there is no information on valves, pump stations, or control stations; and there is no information on the interconnectivity of the various pipeline systems. 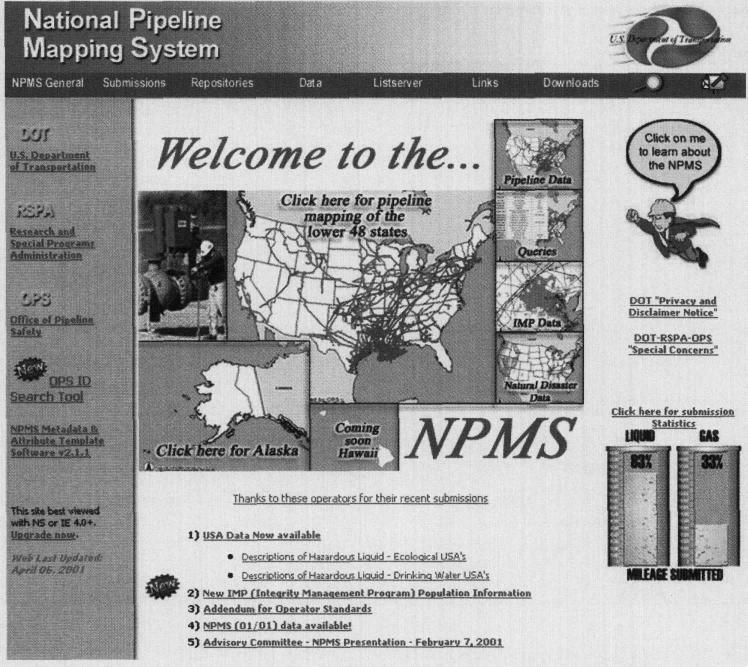 OPS' first milestone for NPMS was to collect 70% of all pipeline mileage jurisdictional to OPS by yearend 2000. 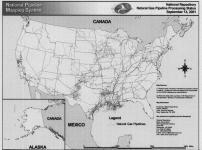 As of Sept. 13, 2001, NPMS contained approximately 61 % of all pipeline mileage jurisdictional to OPS. OPS continues to work with trade associations and pipeline operators in requesting pipeline data and updates to previous submissions. Partial submissions are encouraged in order to expedite population of the database. Increased security measures implemented on NPMS may increase the percentage of pipeline operators submitting data. OPS has received feedback from pipeline operators and the pipeline trade associations about their concerns for data security. Many of those concerns are now being met with the new restrictions placed on NPMS data internet access. It is important to note that NPMS will never be complete. As with all geographic information system databases, the initial drive is to populate the database. After the initial data collection effort, the data must be properly maintained to ensure its usefulness to OPS and the other users. Good maintenance procedures are especially critical when dealing with a dynamic database such as pipelines. OPS will continue in its efforts to collect and maintain the pipeline data, the eventual goal being to integrate NPMS with other OPS databases and to develop applications to create a comprehensive decision-support tool. The events of Sept. 11, 2001, are precipitating throughout the US government. The NPMS data and internet mapping applications, available before that date are of particular concern. OPS has removed the ability for users to download the pipeline and drinking water unusually-sensitive-area data layers and access the internet mapping application. The office is committed to providing pipeline related data to local, state, and federal governmental representatives who need pipeline data to address governmental issues and concerns. data and will work with all governmental agencies on an ad hoc basis until revised procedures are in place. The office is committed to providing pipeline operators the information they need to comply with integrity-management programs. Pipeline operators will continue to be able to download data layers, and OPS is investigating the option of developing more secured internet mapping and data-download tools. 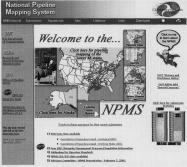 In the interim, directions for accessing data by governmental and pipeline operator users are available on the NPMS homepage ((www.npms.rspa.dot.gov). services within OPS. He began his career by developing geographic information systems (GIS) for the city of Niagara Falls, NY, and after 5 years, worked for 2 years for Sabre Systems and Services, Dayton, Ohio, as project manager for the GIS group focusing primarily on cadastral mapping. Fischer holds a BA (1987) in geography from the University of Central Arkansas and an MS (1989) in geography from the State University of NewYork at Binghamton. faculty, staff, and students of the University of Virginia and also worked with the Virginia Department of Forestry in creating a GIS of forest survey data. More recently, he worked for 2 years as a contractor providing GIS technical support to OPS. Hall holds a BA (1998) in environmental sciences from the University of Virginia and is enrolled in the geographic and cartographic sciences MS program at George Mason University, Fairfax,Va.